I’ve just about had it with this campaign season, in large part because social media is ratcheting up the nastiness to ridiculous levels. Memes are everywhere, as if somehow it becomes okay to say something flippant or mean if it’s accompanied by a cute animal, a famous face, or a cleverly drawn cartoon. How in the world will we make it through to November if our collective behavior continues to plummet below what used to be considered common decency (or—ya know—good manners)? “I just had to share this,” is at the very least, a lie. No you did not. Is your employer withholding your paycheck until you update your status? Has your beagle been snatched until you forward the email? Is someone holding a raw chicken over your freshly washed hands, saying they’ll drop it unless you hit “share?” Then no. (An aside: if someone is threatening you with a raw chicken, then do whatever they say to get away. Raw chickens are gross.) The thing is, you do not have to post it, email it, or tweet it. (Heck, you don’t even have to mention it.) Seriously, no one has to post anything. Ever. You could never share another email or update another status from now until forever and that’d be just fine. So if you post it, then own it: because really, it’s your choice. The direct opposite of saying you are in some way required to pass something along is this endearing sentiment: “If you don’t like this post, unfriend me.” Okay that’s just rude. And bossy. And also, everyone knows they can unfriend you. No one is going to read your status and think, “I don’t like that but whatever shall I do?” No. They either unfriend you, unfollow you, or they deal with it. Plus, chances are, you know pretty well who will like your political posts and who won’t. Just go through and unfollow or unfriend every one whose political beliefs are in conflict with yours. Or you could do this: don’t post incendiary comments or articles if you don’t want to offend people. Even better? Meet your political opposites face to face and talk it out like grown-ups. If you say, "This is funny, no matter which candidate you support," you’re just wrong. It almost always matters. Likewise, for the love of all that’s good in this world, please stop saying "This isn't politics, it's just fact.” If you have to say that in the first place, it is totally politics whether it is fact or not (and it’s probably not). Just sayin’. Stop with the overstatements. Things like, “Republicans are Mean,” or “Democrats are Stupid,” are just too general to offer any significant meaning whatsoever. It’s the political equivalent of “Na-na-na-na-boo-boo,” or “I know you are but what am I?” And plus, if you really think that such sweeping generalities are universally accurate, you just need to get out more. Meet some people who are different from you. Seriously. 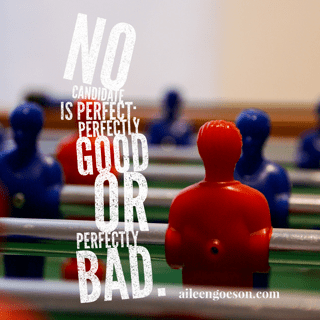 One more thing: no candidate is perfect—perfectly good or perfectly bad. If you agree with everything your candidate says, you aren’t listening very closely. And if you think everything the opposition says is wrong/bad/false, you haven’t done enough research. Bottom line: let’s play nicely with one another. It makes for a better world. What about you? What guidelines do you suggest? Here's a sixth point specifically for Christians - your salvation isn't attached to a politician or political party. Yes! So very true. And a common misconception by followers of Christ.